This post by Trudy Ledsham, is part of Spacing’s partnership with the Toronto Cycling Think & Do Tank at the University of Toronto. Trudy is a researcher for both the Toronto Cycling Think & Do Tank and the Scarborough Cycles Project at the Toronto Centre for Active Transportation, a project of Clean Air Partnership. Scarborough Cycles is funded by the Metcalf Foundation’s Cycle City program, which aims to build a constituency and culture in support of cycling for transportation. A common narrative in discussions of urban suburban divides is that suburbanites both love and own automobiles while city dwellers live car free. This is a deeply rooted assumption that quietly justifies the lack of investment in alternatives to cars in suburban areas. A deeper examination of Scarborough suggests that the idea of monolithic suburban car ownership is a myth. Many households within Scarborough do not own a car and a smaller proportion of Scarborough residents has a driver’s license compared to residents in the core. Mapping is a wonderful tool that allows people to see spatial patterns. But those patterns are completely dependent on the geographic frame, variable or unit of measure that the cartographer chooses. When automobile ownership is examined for Toronto as a whole, it can appear that households in areas like Scarborough all have cars. It is true that household car ownership is higher in Scarborough with an average of 1.3 vehicles per household than in the downtown core (former city of Toronto) where the household average is 0.7 vehicles per household. But this measure does not take into account the number of people in a household. In Scarborough, there is an average of 2.9 persons per household while in the core there are only 1.9 persons per household. If examined on a per person basis, Scarborough has 0.44 cars per person while the city core has 0.36 cars per person–still lower but not as extreme (Table 1). And yes, households in Scarborough have more children than households in the core with 18% of the population aged 0 to 15 compared to only 8% in the core. While not including children in per capita measures might more accurately reflect car ownership, it doesn’t necessarily relate to travel needs. Children also need to travel and walking, cycling and transit are more challenging for parents and caregivers in areas with low transit service levels, little cycling infrastructure and poor walkability. Scarborough surprises in other ways. The median trip length for drivers is 5.2 km in Scarborough versus 4.9 km in the city core—a negligible difference. In the key 6AM to 9AM travel period, drivers from the core actually travel further than drivers in Scarborough (median trip distance 7.9 km versus 6.5km). In the literature on factors influencing car ownership, a higher % of the population licensed to drive is generally related to higher levels of car ownership. Based on this we would expect the core to have a smaller proportion of residents with drivers’ licenses than Scarborough. However, both men and women in Scarborough are actually less likely to have a driver’s license than residents in the core, with only 54% of women in Scarborough having a license. Given that women account for a higher proportion of the population in Scarborough than in the core (52% vs 50%–see Table 2) the disparity is pronounced, resulting in a much lower number of drivers in Scarborough than would be expected, based on car ownership. Given the lack of alternative travel options within Scarborough, .44 cars per person is very low. Scarborough has a higher proportion of women and seniors as well as children than the city core — there is also a slightly higher proportion of lone-parent families and a higher proportion of 1st generation immigrants in Scarborough than in the city as a whole. Many travellers are likely avoiding discretionary trips and adding extra miles to their commutes to drop off a series of family members, while others suffer long trips using sporadic or remote public transit. Disparity in transportation access is intimately linked to inequality in social, environmental and health conditions and outcomes, making transportation access in Scarborough an even more urgent priority, as Scarborough has both poor transportation access and high levels of vulnerable populations.If we look at a map of car ownership in Scarborough (Figure 1), we find that many households do not have even a single car. There are pockets of Scarborough where more than 38% of households do not own cars. These pockets are consistently distant from higher order transit services. We also see that in Scarborough, the limited cycling infrastructure available (especially bike lanes) is all located in areas of high car ownership. This leaves those without cars completely dependent on walking and bus service. Toronto’s suburbs are not monoliths of single family homes with multiple cars. Given the long time horizon on transit infrastructure improvement and current limited active transportation options, Scarborough residents urgently need prompt investment and rapid implementation of active transportation infrastructure and programming. Prillwitz, J., Harms, S., & Lanzendorf, M. (2006). Impact of life-course events on car ownership. Transportation Research Record: Journal of the Transportation Research Board, (1985), 71-77. Potoglou, D., & Kanaroglou, P. S. (2008). Modelling car ownership in urban areas: a case study of Hamilton, Canada. Journal of Transport Geography, 16(1), 42-54. Lucas, K. (2012). Transport and social exclusion: Where are we now? Transport Policy, 20, 105-113. Martens, K. (2013). Role of the Bicycle in the Limitation of Transport Poverty in the Netherlands in Bicycles: Planning, Design, Operations, and Infrastructure. Transportation Research Record, 2387, 20-25. ​Toronto Public Health. (2012a). Road to Health: Improving Walking and Cycling.http://www1.toronto.ca/wps/portal/contentonly?vgnextoid=2685970aa08c1410VgnVCM10000071d60f89RCRD. 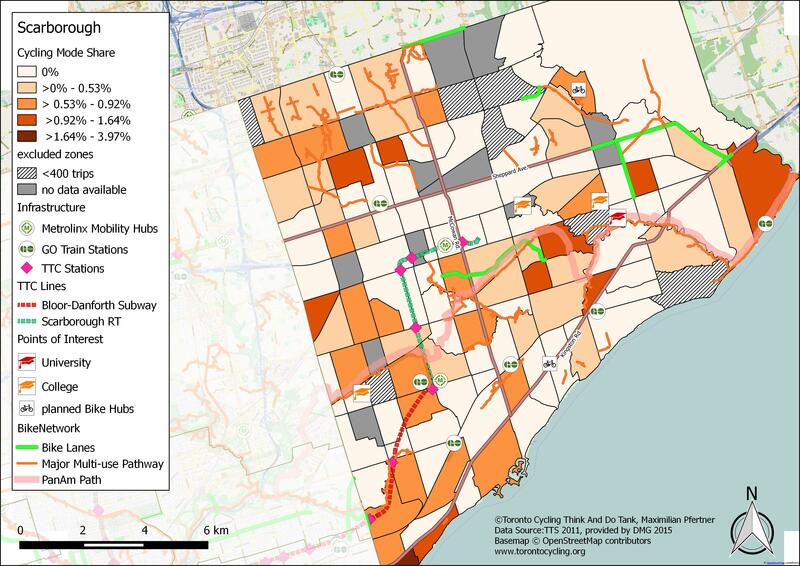 Toronto’s new Cycling Network Plan: What’s in store for Scarborough? ​This post by Marvin Macaraig, Ph.D., is part of Spacing’s partnership with the Toronto Cycling Think & Do Tank at the University of Toronto. Marvin is the Scarborough Cycles Project Coordinator at the Toronto Centre for Active Transportation, a project of Clean Air Partnership. Scarborough Cycles is funded by the Metcalf Foundation’s Cycle City program, which aims to build a constituency and culture in support of cycling for transportation. On May 16th, the City of Toronto Public Works and Infrastructure Committee (PWIC) recommended that City Council increase annual capital funding to $16 million for the proposed Ten Year Cycling Network Plan. This figure was recommended by Transportation Services staff and roughly doubles the City’s annual spending on cycling infrastructure. The plan calls for a total of 525 km of new cycling infrastructure throughout the city, including 280 km of bicycle lanes or cycle tracks on what the staff report refers to as ”Fast, Busy Streets”, 55 km of sidewalk-level boulevard trails also along ”Fast, Busy Streets”, and 190 km of cycling routes on ”Quiet Streets”. In a previous post, I highlighted what Scarborough residents could expect from this new plan. To re-cap, building cycling infrastructure on major corridors like Kingston Rd., Danforth Ave., and Midland Ave. would improve transportation options, especially in southwest Scarborough, which has the highest levels of cycling mode share. Therefore, it is promising that sections of both Danforth Ave. (between Broadview Ave. and Danforth Rd.) and Kingston Rd. (between Danforth Ave. and Eglinton Ave. E.) are slated for major corridor studies during the first three years of the plan in 2017 and 2019 respectively. A major corridor study is used in locations that would achieve an important cycling network link but where the streets are already intensely used for a wide range of existing activities. As part of the study, traffic impacts are assessed and affected stakeholders, such as residents and business owners, are consulted before new cycling infrastructure is introduced. Another notable feature in the plan is the potential to install sidewalk-level boulevard trails along Fast, Busy Streets where space is available. This is significant because currently there are limited examples of this kind of cycling infrastructure in Scarborough (e.g., Ellesmere Rd. between Helicon Gate and Military Trail). Installing sidewalk-level boulevard trails should be further investigated and widely implemented since they have the potential to unlock latent demand for suburban cycling without the need for costly and prolonged road reconfigurations. Unfortunately, the plan identifies possible installation of sidewalk-level boulevard trails in only three locations: 1) Midland Ave., scheduled for 2022-2024, 2) Warden Ave. between Highway 401 and Bamburg Cir., scheduled for 2025, and 3) near Warden Station on St. Clair Ave. E., scheduled for 2019. This $16 million of cycling infrastructure investment is encouraging, however it should be noted that PWIC members also voted to put on hold all of the planned eight major corridor studies (with the exception of three short segments on Bloor St. and Yonge St.), representing 100 km of the 525 km of cycling infrastructure. Members argued that this would allow time to gather feedback and data from the Bloor St. bike lane pilot project scheduled for installation in fall 2016, and provide an opportunity for upper levels of government to fund these future studies. Technically, the eight major corridor studies for 17 segments of Yonge St., Danforth Ave., Bloor St., Kingston Rd., Midland Ave., Jane St., Kipling Ave., and Lake Shore Blvd. W., were not scheduled to start until after two years, so the practical implication of a two-year delay remains unclear. However, several of these corridor studies are scheduled for areas outside of the downtown core where the roadway widths, vehicular speeds, on-street parking and loading issues are quite different to downtown. As a result, the Bloor St. bike lane pilot outcomes, to be revealed in late 2017, would likely have negligible relevance for major corridors in Scarborough, Etobicoke, and North York. Given the historical neglect of cycling infrastructure in Toronto’s suburbs, this further delay will more firmly entrench the infrastructure gap between the downtown core and the outer neighbourhoods of our city. A ­May 2016 Angus Reid Forum poll revealed that 88% of Scarborough residents support a comprehensive, interconnected and safe cycling network. In addition, 69% of Scarborough residents said that the City urgently needs to create better bike infrastructure. The poll also revealed other important insights such as the absence of an urban/suburban divide when it comes to support for the completion of a safe cycling network and that there is support across the city for immediate increased investment in cycling infrastructure. Finally, the poll results also showed that a majority of residents feel that physically separated bike lanes would facilitate traffic movement. All things considered, Toronto’s new plan will eventually help to address several key gaps in Scarborough’s existing cycling network, including Danforth Ave. and Kingston Rd. Building cycling infrastructure on these corridors will also leverage the efforts of our Scarborough Cycles bike hubs located at AccessPoint on Danforth and Birchmount Bluffs Neighbourhood Centre, near Kingston Rd., both of which are offering several programs to help build and develop cycling culture in Scarborough. On June 7th, Toronto City Council will decide whether or not we will move ahead to create a city-wide safe cycling network that equitably serves all areas and residents in the city, or whether we will risk further delaying this critical transportation option for generations to come.